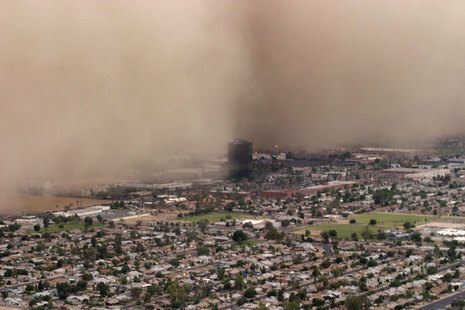 As our flight approached Phoenix International Sky Harbor Airport (I've always liked the name "sky harbor"), we were immersed in an ominously brown cloud. As I commented to Marysia at the time, it looked too thick (and summer is not the right season) for it to be the smog that can engulf the city. And we're not just talking about up-and-down turbulence, but side-to-side and on all sorts of odd angles. The flight attendant joked that folks in the back wouldn't need to go to Disneyland for thrills (the flight was to continue to Orange County). I began to get concerned. And just about at the time that I was thinking, "This ain't right," we suddenly pulled out of the landing and made a rapid ascent. Never before have I been on a flight that aborted its landing so close to the ground. It was very scary. We circled around, above the storm, for a few minutes. 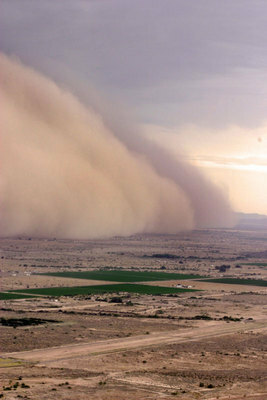 Thinking back to my experiences with dust storms as a youth, I thought to myself that one good thing about them is that they hit quickly and move on. Then the pilot informed us that we were going to make another attempt to land. (I can't say I was eager for us to be the first plane to attempt this.) If it still seemed too rough, he continued, we would be diverted to Las Vegas. Fortunately, our second attempt to land was very smooth. Unfortunately, the damage to Ian's stomach had already been done and as we touched down, he threw up. He wasn't the only kid to do so, either.